I had said in comments to Revo Uninstaller post that every tech blog has post on CCleaner. After doing complete diagnose/update/cleanup routine on six PCs during my work day (and two more instead of my lunch) I am probably going to dream about CCleaner today. Might post about it as well. Programs should keep all their stuff in memory. Unfortunately they don’t. And even if they want to there is still not enough memory in consumer PCs for some tasks. So temporary files are born. Unfortunately they are not temporary enough and as any temporary thing they might stay in your PC forever. is smart enough not to nuke your documents together with them. CCleaner is pretty close to formula. plus you know what tool to give your boss when he calls around midnight and asks to help his friend who has problem with removing some… nasty words from browser history. Main advantage of CCleaner is popularity. Most of software receives popularity for functions. But CCleaner is good because it is extremely popular. That means developers have to be extremely careful and if they let out version that kills some documents they are going to get eternal suffering. Literally. 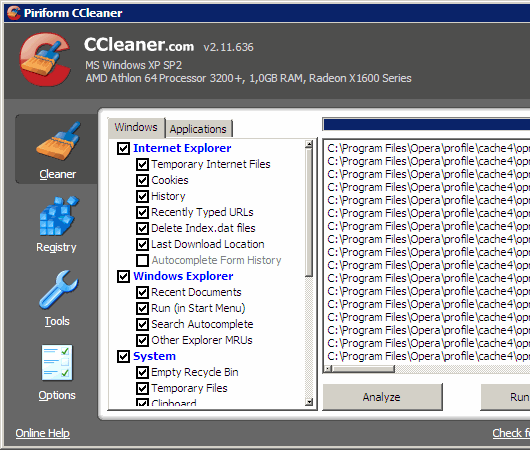 As a result CCleaner is extremely safe to use both for file and registry cleanup. It may miss some stuff that other more thorough apps will pick up. But it won’t break your Windows in pieces. Freeware, regular updates and portable version available. Nice. I just downloaded CC Cleaner, and thank you so much, I was using another registry cleaner that was very limited unless you upgraded to the paid version, this will work very well for me. I’m glad my post was useful for you. :) Shows that no matter how hyped software is – never hurts to mention it once more if it would make life easier for someone. its useful now iwont get bothered with this 58mb hurting my memory.